The Mad Hatter is described as one of the key allies of Alice in her struggles to defeat the Red Queen and return control of Wonderland to the good White Queen. In the movies Alice in Wonderland and Alice Through the Looking Glass, Johnny Depp played the character as a mercurial eccentric, whose accent and personality changes with his moods. This dazzling Mad ensemble features a stylish brown frock jacket with shimmery vest, multicolored bow tie, lace cuffs, sash, and elastic knickers. In collaboration with the film’s costume designer, Colleen Atwell, Depp opted to give the Hatter the look of an actual milliner from the Edwardian era, but with a playful twist. Thus, apart from the elegant but colorful ensemble, the Hatter also sports white pancake make up and an orange wig (which was intended to indicate that the character suffered from mercury poisoning, a common affliction for milliners of that time, since they used mercury to cure felt). 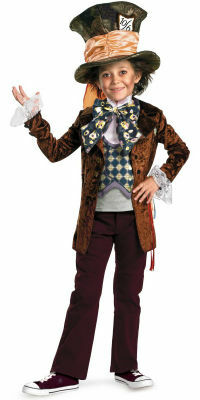 If your daughter enjoyed watching Alice in Wonderland, she can also dress up as the eccentric Mad Hatter for Halloween! She will love this attractive Mad Haddie dress costume creating her own storybook tales and tea parties! 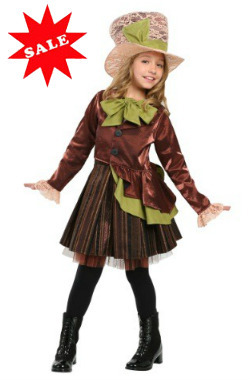 Inspired by the movie Alice in Wonderland, this kid Mad Hatter Halloween costume features the jacket, shirt front, bow, and child Mad Hatter hat. This deluxe authentic Mad Hatter ensemble is made comfortable for big guys and it is available in multiple plus sizes for men: 2X, 3X, 4X, 5X, and 6X. 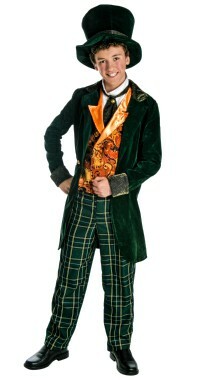 If you are searching for a good teen outfit, you will want to pick this fantastic Mad Hatter ensemble for teenagers! 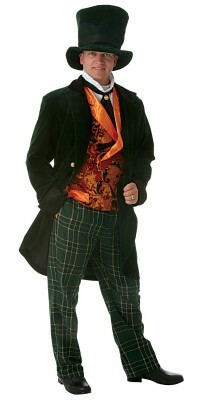 This deluxe set includes the character top hat, green velvet jacket, orange vest, metallic color ascot, front shirt with tie, and green plaid twill pants with elastic waist. 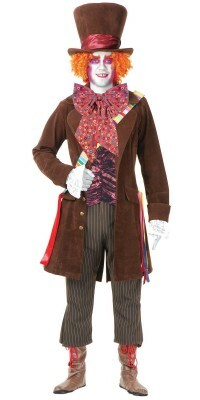 This adult costume features the dark jacket, vest, pants, dickey with bow tie, gloves, shoe covers, and Mad Hatter top hat. 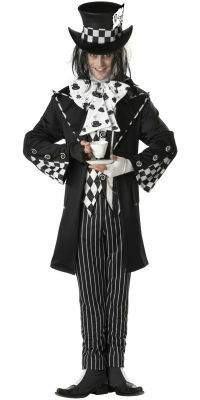 The Mad Hatter is probably the most popular character to emerge from Disney’s new live-action movie Alice in Wonderland, directed by Tim Burton. The film, which has grossed over $300 million in the US and over $800 million worldwide, is also the second movie released in 3-D to hit this milestone, following 2009’s Avatar. As played by star Johnny Depp, the Hatter was a major selling point of the movie, as the character was prominently featured in both posters and trailers marketing Alice in Wonderland. The success of the film is sure to make the Hatter’s outfit one of the most requested Halloween costumes. You can buy a full costume consisting of a velvet fitted jacket trimmed with lace at the sleeves, lacy shirt front, brightly patterned over sized bow, pinstriped pants, and of course, the top hat with the iconic 10/16 label and orange hair attached. If you would like to create your own costume, you can buy the hat separately, with or without orange hair attached. The costumes are available in teen and adult sizes and are sure to make you the hit of the party this Halloween.